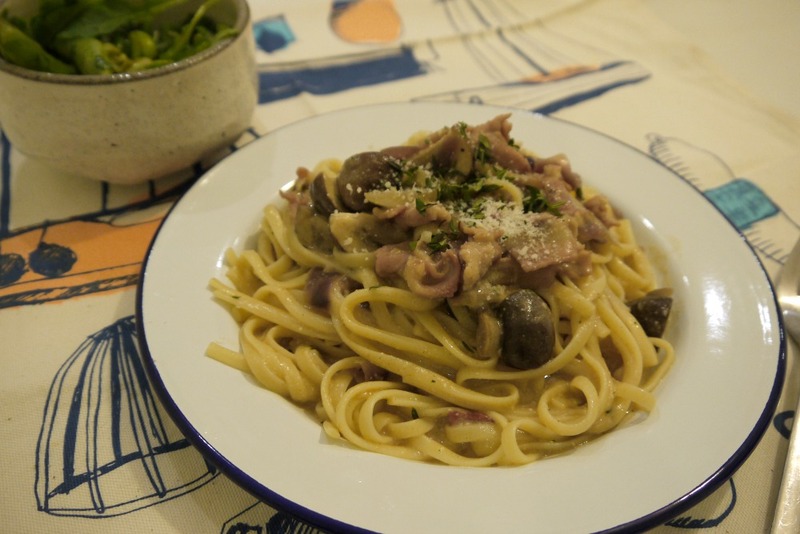 My friend Lucy shared this delicious Creamy Mushroom Stroganoff recipe with me a while back from gusto box. It's a quick one so it's worth sharing with you all perfect for the weekday when you don't have much time and you are bored of the usual spag bol. The creamy stroganoff sauce is made with sour cream, thyme, paprika, chestnut mushrooms and we added in extra bacon served on a beautiful Falcon plate which I am currently obsessed with...anything white with a blue rim I absolutely love and I am slowly changing all my bowls / plates etc..You can view the whole collection at Amara. Now onto the recipe which takes no longer than 30 minutes to make!